"This old district is a hero" Victor Hugo said when describing the 11th arrondissement of Paris. Located on the right bank, the former revolutionary stronghold, famous for its Bastille, has become a Mecca for culture. With its many theatres and concert halls, this district today represents, much to the pleasure of the insiders, one of the fashionable districts of the capital. La Place de République, after its redevelopment in 2013 has regained its attractiveness, its dynamism and its conviviality. The boutique of Christophe, which is not far from this emblematic place, 12 boulevard Voltaire, is the institutional address of the district. This optical store was established in 1927. The father of Christophe learned his optician trade there in 1959 before becoming the owner in 1972. Christophe took over the store in 1997. A wind of change was blowing over the spectacles world. Optician optometrist, he combines his profession with the love for beauty. 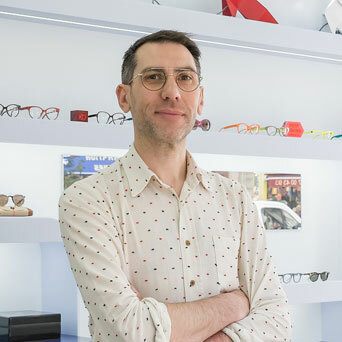 Curious and demanding and with a thorough understanding of his customers, he scours the collections looking for skillfully designed frames and keeping only the best. Equipped with the latest technology in the measuring process, the assembly and the control of the eyeglasses, he provides a high-quality vision with Essilor ophthalmic lenses. If you dare to enter his universe, it’s sure that you will adopt it. This titanium half moon frame is put back in fashion by Thom Browne. The slightly tinted lenses Essilor Ormix EPS Crizal Sapphire+ black 2 will upgrade your look. A request for information, need an appointment or renew your contact lenses, thank you to leave a message via the form below.